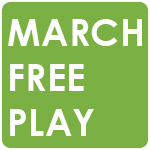 Play for Free Right through March! Find the Mystery Game and Play for Free Every Day! We’re running a special promotion right through the month of March. Every day a different game at Prime ScratchCards will be completely free to play; and you can still win INSTANT CASH PAYOUTS and massive PRIME JACKPOTS. All you have to do is guess which game to play and you’ll automatically get 100% CASHBACK*. To make things easier for you, we’ll tell you which games have already been free, and you’ll have 31 days pick a winner. Guess the Right Game and You’ll be £££s Ahead! Previous Previous post: Last Chance to Win £10,000!